Now your family and loved ones can also enjoy the exclusive personal care and unmatched convenience of the Platinum experience. Its elegant product packaging, dedicated services and complimentary benefits ensure that they feel as privileged as you! 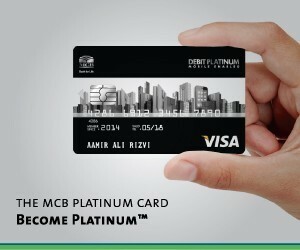 MCB VISA Debit Platinum Supplementary Card is accepted at millions of merchant locations nationwide/worldwide with shopping limit of PKR.150, 000. Platinum supplementary card holders can Transfer Funds to any other MCB Account PKR.100, 000 on daily basis. Be it shopping at popular retail outlets, relaxing at spa, having fun with friends and family or dinning out at the finest restaurants, benefit from gratifying discounts offered on your MCB VISA Debit Platinum Supplementary Card.